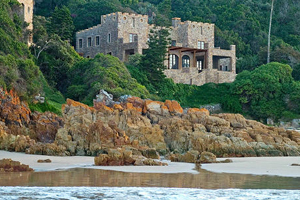 Luxury South African venue Pezula Private Castle is offering a special package for the Fifa 2010 World Cup. The property, located near Knysna, is offering a special package featuring Champagne and oysters, helicopter transfers from George Airport, meals and activities at the nearby Pezula Resort Hotel & Spa golf, horse-riding, canoeing, hiking, tennis, and archery. The castle offers a gym, heated outdoor pool and a thatched gazebo.